Today marks the repose of HH Alexander III (Tahan), the 167th Patriarch of Antioch. In addition to reviving the churches, monasteries, and seminary of the patriarchate around the world, HH Alexander III approved the establishment of the Western Rite throughout the patriarchate. The founding of the Western Rite Vicariate -- unlike nearly every other event in WRO history -- can be seen as nearly a series of happy coincidences. Fr. Paul Schneirla visited France, where he felt no particular attraction to the "Gallican Liturgy" celebrated within L'ECOF, but he happened to visit the parish of Dom Denis Chambault in Paris. The Orthodox Benedictine monk's reverent celebration of the Liturgy of St. Gregory (the so-called "Tridentine" Mass) and Benedictine Hours so moved him that upon his return to America, he asked Met. ANTONY Bashir about the possibility of a similar Western Rite within Antioch. Fr. Schneirla says he merely raised the eventual potentiality; the question was more theoretical than actual. Met. ANTONY queried HH Patriarch ALEXANDER III, who -- to Fr. Schneirla's surprise -- sent in return a copy of the Russian ukase on the Western Rite and tasked the archdiocese with its implementation in North America. Thus was born the Antiochian Western Rite Vicariate (to the rejoicing of men and angels). Fr. Schneirla's question could scarcely have come a moment later. His Holiness, in consultation with hierarchs in other autocephalous Orthodox churches, authorized the Western Rite on May 31, 1958. He was translated on June 17, 1958. His full legacy -- not just the Western Rite -- remains with us today, and undoubtedly mulitiplied his crowns in Heaven. May every Western Rite Christian live in a manner worthy of his faith in us. May he rest in peace, and may we poor sinners be aided by his prayers below. An ancient Good Shepherd statue found in the Roman catacombs. A fascinating scholarly article from Ember Tidings, the official publication of St. Peter's Orthodox Church (AWRV), Ft. Worth, Texas, on the subject of statues in Orthodoxy. I added the images below to enhance the article. Unfortunately, the text is not currently on the parish website. The innumerable beautiful ancient icons that have flooded the west since the first World War, and the increasing interest in them by artists, scholars and ordinary lovers of the beautiful has been one of the bright phenomena of the past two generations. An enormous literature has developed around the icon, both scholarly and popular, and centers for the reproduction of old icons, and the painting of new ones has become especially widespread since the Second World War. For a great many people the Icon is the supreme symbol of the Orthodox Church. This has been especially true on the popular level since the western world was flooded by Russian émigrés and religious artifacts following World War I. Shortly thereafter the revival in Byzantine studies gained impetus and icons were studied on a serious level while the antique shops offered examples of everything from rare ancient specimens to the great liquid-eyed 19th century romantic western imitations that in the eighteenth century had supplanted the traditional types in the Orthodox lands. For many westerners, and in the Orthodox folklore, icons are the Eastern substitute for statues commonly, and erroneously, believed to the forbidden in the Orthodox Church. Actually, statues are by no means forbidden in Orthodoxy and were always a regular part of the decorative and devotional furnishing of the sacred space, the church interior. Icon, now commonly used as a technical term for the flat, perspective less devotional pictures of oriental Orthodoxy is simply the Greek word for “image.” The Ecumenical Counciliar dogmatic decrees on icons refer, in fact, to all religious images including three-dimensional statues. How, then, did the common opinion arise that statues were “western,” “heterodox,” “heretical”? The answer is quite simple and derived from sound cultural and sociological foundations. Statues were common in Byzantium. Our title picture illustrates an ivory, three-dimensional statuette, of the Virgin and Child, “Hodegetria,” from 10th Century Constantinople. Now in the Victoria and Albert museum, it differs from similar examples in Hamburg and New York, in that it was not cut out of an ivory tablet. The back is as carefully and skillfully carved as the front. The ivory Hodegetria statue from Victoria and Albert Museum, London; 10th c.
Constantinople was filled with statues, both within and outside of the churches. One author claims that over three hundred classical statues adorned the plaza before Sancta Sophia. The famous Spanish Madonna, Our Lady of Montserrat, is a Byzantine statue as are many ancient examples in southern France, but it was in Russia that Orthodox Christian freedom in the use of images survived. Let us consider the reasons why statues became unpopular in Orthodoxy. Our Lady of Montserrat statue. The main cause, of course, is Iconoclasm (image breaking). As early as the art in the Roman catacombs Christians used sacred images, both for instruction and, evidently, as a means of venerating the person or event depicted. Most of these are paintings, but at least two statues of the Good Shepherd are anterior to Constantine and the Veneration of the Cross is so ancient no initial date can be fixed for it. By 576 we have evidence, in the west, that an image of St. Martin was honored by a lamp constantly burning before it and that Fortunatus had been cured of an ailment by oil taken from it. By the beginning of the 8th Century the Jews, basing their stand on the Old Testament proscription of images, the Paulician heretics (a branch of the Manicheans, a sect that despised “matter’ as inferior to “spirit.”), and the Monophysites all opposed images. These latter were heretics who declared that Jesus was God and hence His human nature was swallowed up by His divinity and so his unimportant humanity should not be depicted. Furthermore in some areas: Syria, Egypt and among the Germanic tribes, there was a basic distrust of the Greek esteem for human beauty, especially as manifested in art. All of these influences seem to have proven congenial to the Emperor Leo the Isaurian who in 726 issued his first edict for the destruction of images. There was popular opposition, the Roman bishops protested, and St. John of Damascus summarized the testimony of the Fathers in the three famous essays. Leo died in 740 and was succeeded by his son Constantine V, Copronymus, who pursued his father’s program with barbaric vigor. When he died in 780 his wife, Irene, began the work of restoration and seven years later convoked the Seventh Ecumenical Council in Nicaea which fully restored the veneration of images. After a subsequent period of persecution (the Iconoclastic movement survived in some strength from 726 to 842) the restoration of images was fixed in 842. The anti-image influence in Constantinople came from Syrians and Armenians, tinctured by Monophysitism, in the west it came from the Emperor Charlemagne and persisted in the Frankish lands until the ninth century, although Rome and Italy adopted the Orthodox position from the first. It is evident from this survey that racial-cultural heritages were highly influential. Sarcophagus of the Bambino, Roman catacombs. The same may be said of the practical disappearance of statues as opposed to icons over large areas of the Orthodox Church. The lingering memory of the Iconoclasts encouraged reticence and the Moslem conquest froze Orthodox art in its most limited form. In the conquered areas the Church was driven indoors, bells were proscribed, and the externals of Christian worship were forbidden in public. While all representations of creatures were banned for Moslem, and pressure put on Christians to conform as much as possible the icon survived while the statue could not. Only in Russia was the Church free enough to maintain its full aesthetic devotional tradition. Northern Russian woodcarving was highly developed before the coming of the Orthodox missionaries and it survived and was “baptized” into the service of the Church. All images, statues and icons, were carefully watched by ecclesiastical authority as in a ukase of the Holy Synod on March 15, 1722. From the Revolution of 1918 until after World War II statues of historical value suffered the destruction directed at all religious monuments, but currently concern for the achievements of the Russian past has focused money, attention and research on all ancient art and Orthodox statues are especially valued. Hundreds of examples of these devotional objects were destroyed in the first phase of the Revolutionary anti-religious campaign. Yet many statues and three-dimensional crucifixes are plentiful and still in use. The 1920’s discovered the Orthodox painted icon, the 1970’s the Orthodox statues. It appears the sometimes heated "two dimensional vs. three dimensional image" argument could be another example of culture intruding upon the faith. When Thou hadst overcome the sharpness of death: Suffered under Pontius Pilate, Was crucified, dead, and buried. We believe that Thou shalt come: to be our Judge. From thence He shall come to judge the quick and the dead. All the earth doth worship Thee, the Father everlasting. The Father everlasting. This confirms once again that the best devotional texts are often theologically rich. (California State) Treasurer Phil Angelides came out Monday against an amendment to the state Constitution that would require doctors to give parents or guardians written notice 48 hours before performing an abortion on a minor. Perhaps HH Bartholomew will also call Angelides a "model Greek Orthodox Christian." I have not followed the General Convention of ECUSA in Columbus, Ohio, but I just peered at some of the coverage: it is not encouraging for those who, against all recent history, continue to work "inside the system." Two quick items. I believe, with the greatest of heartbreak and sadness, that the day has arrived where those who have chosen the Episcopal Church because of its catholic and evangelical reliability, and those who have chosen the Episcopal Church for its revolutionary character, can no longer be held together. The future in Communion rests only with the former of the two. It cannot be both ways into the future. Actually, everything in the past several decades of ECUSA history demonstrates the "revolutionary" faction is ECUSA's past, present, and will progressively elbow out all others to become its lone future. 1. Eradicate extreme hunger and poverty. We are not going to retreat from where the Holy Spirit has led us in the past. But we’re not going to allow the debate of those decisions to dominate our current discussions. The wind of the Spirit has moved on, and so must we. "When the ship is holed, let the man who can swim swim" -- St. Gildas the Elder. Fr. 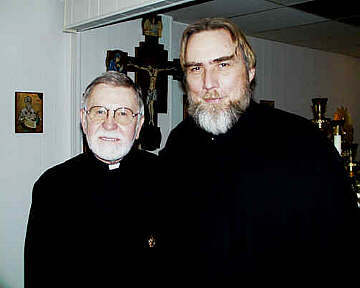 Antony Bell (right) with Fr. George Smith. It is with utmost sorrow we report that Fr. Antony (Carl) Bell, priest of St. Mary Antiochian Orthodox Church in Topeka, IN, passed into eternal life on the afternoon of June 14, 2006. Raised in Piqua, Ohio, Fr. Bell graduated from Nashotah House seminary to become a priest in the Episcopal Church USA during the tumultuous 1970s. He served a large and prosperous parish in Philadelphia -- which, he would note for purposes of familiarity, appeared in a few shots of the film Trading Places -- and rolled his eyes at the country club lifestyle he was expected to maintain. As ECUSA accelerated its unbroken slide into apostasy, he sought to defend traditional Christianity "within the system" by transferring to more conservative episcopal oversight in Illinois, before landing in Goshen, IN. Soon, the long arm of apostate church leadership asked Fr. Bell to genuflect to its "liberal" agenda. Casting about for alternatives, he began to investigate the Orthodox Church, and he soon came to believe Orthodoxy was not a safe escape route for Anglicans; it was the One Holy, Catholic and Apostolic Church. Defying his left-wing detractors, he brought a dedicated and courageous group of parishoners into the Orthodox Church. Members of the Western Rite Vicariate remember Fr. Bell for his powerful sermon at the Western Rite Conference in Oklahoma City. In the late 1990s, his years of pipe smoking as an ECUSA priest caught up with him, and he was diagnosed with cancer. In 1999, he changed to the Byzantine rite, becoming the third struggling Eastern Rite parish in a rural Mennonite city of 40,000; a number of families left the parish as a result. He also began to go by the priestly name "Antony" rather than "Antony" and to wear his cassock wherever he went. Fr. Bell had taken a thankless but important job helping abused children when his cancer recurred; he channeled any self-concern into a new position as a chaplain at Cancer Treatment Centers of America. He later moved his parish 45 minutes east of Goshen to the town of Topeka. In recent years, he has remained an active priest to the faithful at Topeka (with help from Fr. George Smith) despite continuing health concerns. Fr. Bell began entertaining doubts about ECUSA, he said, when he compared a pampered lifestyle to the simplicity of the Gospel. In part his hope for a less self-indulgent path led him first to the Midwest, then to Orthodoxy. When others at Parish Life conferences enjoyed luxurious rooms, he sought out nearby monasteries instead. Parishoners remember his dedication to learning about, teaching about, and most importantly practicing the life of prayer. He was also an avid gardener. He is survived by two sons (at least one in the military) and his wife. Grant him eternal rest, O Lord, and let perpetual light shine upon him. May he rest in peace. COME HOLY GHOST, fill the hearts of thy faithful and kindle in them the fire of thy love. O God, who didst instruct the heart of thy faithful by the light of the Holy Ghost, Grant us by the gift of the same spirit to be truly wise and rejoice in his consolation. Through Christ Our Lord. Amen. Fr. Petranek and the faithful of Houston's Western Rite Orthodox church. Blessings to you and Elaine, your children, and your Christ-loving congregation. I received your list of the three suggested names put forward by your flock, and have determined that our Diocese's newest mission effort will be placed under the patronage and protection of THE HOLY APOSTLE PAUL feast day: The Conversion of St Paul, which is kept annually on January 25th and will be known as St Paul Orthodox Christian Church. May your missionary efforts be blessed by the powerful intercessions of this holy missionary. I read the congregation is slated for chrismation on November 11, and Fr. Petranek for ordination two weeks later. Here's an interview with Fr. Petranek. May God bless the vineyard He planted with His Right Arm and establish it. And may He plant hundreds more around the world. "Although there's no precedent for this, toking Bishop Spong crazily studied under a whole flock of vicious thieves." And this might make the task of rumor-mongering easier for some; just let the web do it for ya! A question from the mailbag: "Why is the Feast of Pentecost sometimes called "Whitsunday" in the Western Rite -- 'White Sunday' -- when the liturgical color is red?" Answer: Yes, the terminology at first seems contradictory: a priest clad in red vestments presides over "White Sunday." 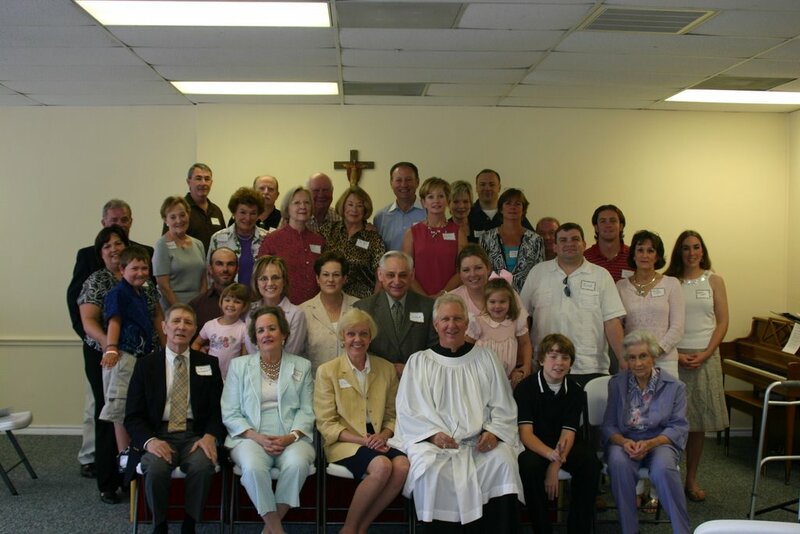 The reasons is because those who had been baptized/chrismated on Easter again put on their white robes; hence, the church was filled with new Christians clad in white. (O for those days!) The liturgical color red indicates the Holy Spirit, Who descended upon the disciples and lit upon them as "tongues of fire." I hope this explains why a "red letter day" is referred to as "white." a bit geeky and have great power and responsibility. Update: I see they have removed their sermon on Pentecost -- which for them was last week -- and replaced it with a sermon on Holy Trinity. To understand the post: the original sermon likened the Holy Spirit's bursting forth on Pentecost as a "rushing mighty wind" and lighting upon the Apostles as "tongues of fire" to the dramatic entrance superheroes made....hence this stupid post from a stupid man. Making Kneeling a "Mortal Sin" and Other Perils of Liturgical "Improvement"
Kneeling “is clearly rebellion, grave disobedience, and mortal sin,” Father Martin Tran, pastor at St. Mary’s by the Sea, told his flock in a recent church bulletin. The Diocese of Orange backs Tran’s anti-kneeling edict. even if standing has been a practice in the Western Church, vis-a-vis RCs in its recent "developments" it is a blatant declaration of war against anything medieval. It also witnesses to the "new man" mentality that the Consilium with the late Msgr. (only later Apb) Bugnini as its General Secretary engineered into the new mass. Alas, this is not understood by some, who insist on meddling with traditional Western ways in order to "return to the primitive church." Needlessly changing unobjectionable practices -- especially those that have been part of Western piety for centuries -- indicates, not an old spirit, but a very new one: the desire to mold the established worship of all others to one's own academic research or predilections. The result is outraged and disspirited laity persecuted for upholding their traditions.